The prominent position of Midea between Mycenaean centres of Argolida has been focusing emphasis by researchers of the Mycenaean civilization. 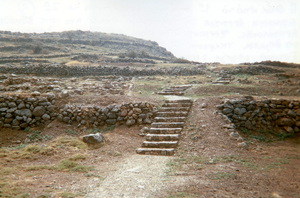 Midea is considered as the third most important fortified Mycenaean Acropolis of Argolida, after Mycenae and Tiryns. 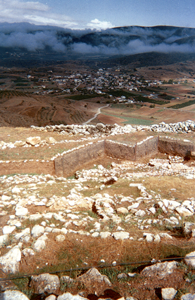 The cyclopean fortifications, the findings of recent excavations, the position of the mythology and its connection with the extensive Mycenaean cemetery in the neighbouring Dendra, rank Midea in the major Mycenaean centres of the mainland. The Acropolis is built on top of a conical hill at an altitude of 270 meters from the sea and 170m from the surrounding area .It is located in the middle of the distance between Mycenae and Tiryns dominating the eastern outskirts of Argolida plain. Its strategic location, with the uninterrupted view provides the ability to control the entire plain and Argolikos bay. This explains mainly the development and prosperity of Midea during the Mycenaean era. The cyclopean wall encloses an area of about 24,000 sq.m. and protects the upper Acropolis and the lower terraces northeast and northwest of the hill. The southeast side is steep and for this reason it was not fortified. The gates of the Acropolis are opposite to one another on the east and west side of the fortification. 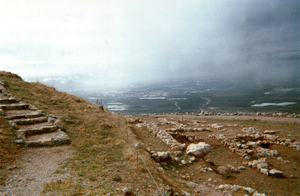 Outside the gates, the Cyclopean fortification is another major project, used for irrigation of the Acropolis of Midea and it is similar to analogous structures at Mycenae and Tiryns. This tunnel was opened in ekforic system in the thickness of the western part of the wall, which led to an underground water source.